In India, my mother-in-law makes fish fry every alternate Sundays. Though cleaning the fish is a 'process', she does it very quickly (maybe practice) and makes these fries for appetizers. Lunch time during Sundays are awfully busy. Cooking for 6 people, 6 different ways was time consuming. But we had fun, as me and my co-sister would be joking all the time in the kitchen. hmm..fun times! Fish is very good for health and few people consider fish as vegetarian(!?). As it is full of protein, if you are a non-vegetarian, you must consider adding more fish to your diet than meat or poultry. Wash the fish in running water and using a tissue paper remove the moisture from the fish. In a small bowl, add turmeric,coriander powder,chili powder,ginger garlic paste,chopped curry leaves,chopped coriander,green chilies, salt. Add oil to this mixture so that we do not use oil while frying/grilling. Now, apply this mixture to the fish so that this masala evenly coats the fish. 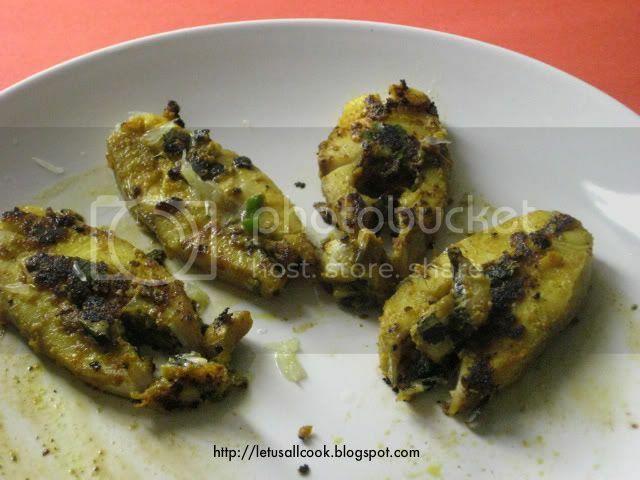 In a Tawa/Grill, place the marinated fish and cook for 3 min, turn and cook for another 2 min till the fish is cooked. On the whole, after 7-8 min the fish is cooked and ready to eat. Always cook it in a medium heat. Serve hot. fish with lovely color too.. Collect your award from my blog. Award time ...do drop by and collect! OMG this looks amazing, I love Indian food. I am so glad that I found your blog. it looks so yummy...i wish i could taste it..slurp!! !I love your blog.The funny part is it is my favourite pastime to go through all the images in your blog, very good presentation and awesome cooking skills.